We offer thoughtful, independent wealth and investment management services throughout New Zealand. Our ultimate goal is to provide our clients with the greatest probability of achieving their goals and financial objectives. We offer thoughtful and independent wealth and investment management services throughout New Zealand with dedicated and ongoing advice from highly qualified and experienced advisers who are committed to your financial well-being. Our clients include individuals, families, and businesses with a wide variety of wealth management needs. We also assist families and individuals who find themselves with new responsibilities when unexpected life events occur. This is the level of volatility of returns in your portfolio, measured by standard deviation. For example, if you own a high-risk portfolio it will increase fast in good markets and decrease fast in bad markets. In other words, over the short-term the portfolio’s value is very volatile. If you own a low-risk portfolio, the opposite is true. Your portfolio’s value will increase at a steadier, slower pace, and is more insulated from downward movements. This is essentially the growth-rate of your portfolio. Given enough time, a high-risk portfolio will earn higher returns than a low-risk portfolio. Risk and return must be considered together. Although most investors want high return and low risk, this is not achievable in the long-run. The fastest way to find an investment charlatan is to look for the person offering high returns with low risks. So, based on the level of risk you are willing to take, how do you achieve the highest returns? Through diversification and exposure to the types of risk that compensate investors with higher returns. The following chart demonstrates the risks and returns of Cambridge Partners investment management portfolios over 24 years from 1991 – 2014, compared to an index that represents the returns of the New Zealand stock market (NZSX 50) over the same period. All investment management portfolio returns are shown net of management fees, but gross of adviser and custodial fees. The NZSX 50 Index has no fee. As evident in this plot, higher risk portfolios (seen on the horizontal axis) lead to higher returns (demonstrated by the vertical axis). 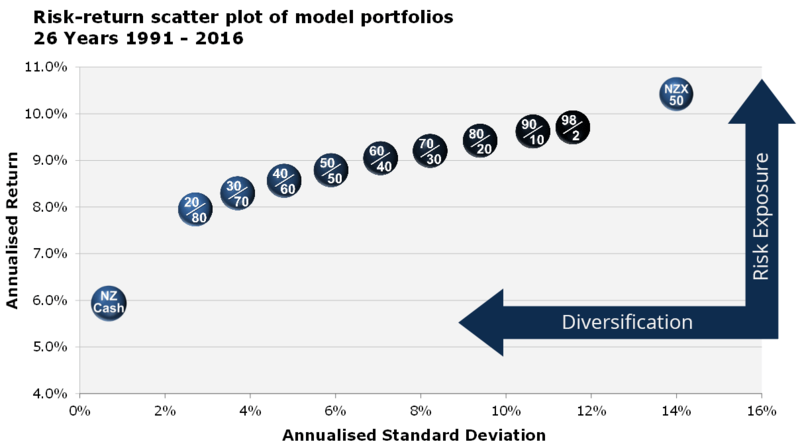 However the key is that by diversifying portfolios, we are able (over a significant 20 year time period) to increase returns relative to the NZSX 50, while taking less risk. Our portfolios do not promise returns without risk; rather they employ financial science to identify those risk factors that lead to better investment outcomes. What do you want to do with your money? When do you need to use it? How can we make your financial goals and dreams a reality? We develop wealth management strategies with our clients’ goals and dreams firmly in focus. You can trust our investment advice because we have no products to sell, take no commissions, and have no conflicts of interest where we serve our clients. We have a specific objective, which is to help our clients achieve their goals. How much risk should you hold in your investments? How much risk are you bearing in your portfolio right now? Many investors can’t answer either of these critical questions. These questions are important because risk forms the basis of investment returns. Cambridge Partners clients are all invested according to their risk capacity and financial need using diversified portfolios that have in excess of 8,000 underlying investments. Have you ever found yourself chasing a hot stock, or investing based on a magazine article or tip from a friend? Many people invest in this way to find not only that they are no better off, but often much worse off than if they’d stayed the course. At Cambridge Partners, we invest with the aim of achieving real, long-term wealth creation for our clients. We are committed to evaluating and enhancing our investment solution. Finance is a developing science and Cambridge Partners will continue to use that evolving science in order to improve the portfolios of our clients. Our investment management solution is formally evaluated every two months by the Cambridge Partners Investment Management Committee, to ensure our clients achieve the results they expect and to determine what might be improved. a. Are our portfolios consistent with the current tax and regulatory environment? b. Are any new investments available that offer increased diversification, enhanced asset class management, lower cost, or better risk-factor optimised characteristics? a. What is our performance, relative to benchmark? b. Are there any corporate actions or other issues that require attention? a. What is the latest research on portfolio management telling us? 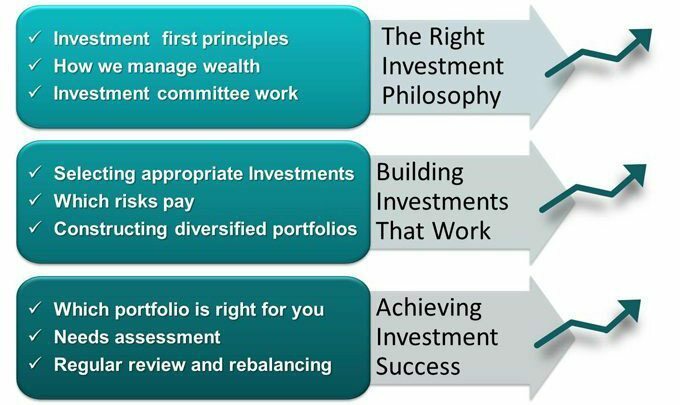 At Cambridge Partners we construct portfolios based on our key principles. In the long term, low cost investments perform better than high cost investments. This is supported by nearly every academic study on the subject. One of the most recent of these studies was carried out by Morningstar. A speculative investment is one in which a winner must be offset by a loser. For example, if a poker player wins a hand in a casino, he or she only ‘wins’ what others have ‘lost’ and inevitably, the casino takes a cut for arranging the game. The same is true with investment speculators in their approaches to portfolio management; they try to beat the market by trading with other participants who are also trying to beat the market. Diversified portfolios provide greater return at less risk than non-diversified portfolios. Risk is the source of investment returns, but the best portfolios are constructed of different types of risk. The risks facing the New Zealand economy are different than those facing the European Bond Market and different again to the risks of Canadian shares. Cambridge Partners selects investments that increase diversification and lower the risks to our clients. While we have asserted that risk is the source of return, not all risks pay the same. This is the risk of capitalism that affects all businesses including political stability, interest rates, credit availability, etc. In other words, market risk is not business-specific risk. For example, it does not address the risk that Microsoft faces competing with Apple, or that Westpac faces competing with Kiwibank. Business-specific risk can be diversified by simply owning shares in all businesses. To put it simply, you don’t care which business wins, as long as ‘business’ is ‘winning’. Because business-specific risk is diversifiable, there are no additional expected returns for holding it. Market risk cannot be diversified and thus investors are compensated for holding it. This conclusion helped Bill Sharpe win a Nobel Prize in 1990. This is the risk associated with small businesses. Small businesses must pay potential investors higher rates of return because they are more likely to fail. However, because these businesses are small they enjoy a greater upside if they succeed. We measure size risk using market cap. Market cap is the total value of a firm’s shares. This is the risk associated with businesses that appear to have poorer prospects, or are out of favour with investors. To raise capital, these out-of-favour businesses must offer investors higher returns because investors are not convinced of their long term profitability. However, since these businesses are out of favour, there is a greater upside if they turn their businesses around. Value risk is measured using book-to-market ratio (BtM). The BtM tells us the ratio of the firm’s accounting value to the market value of the business (its market cap). Out-of-favour firms are termed ‘value’ and in-favour firms are termed ‘growth’. The greater a portfolio’s exposure to market, size, and value risk factors, the higher its expected returns. The essence of proper investment management is assembling a large number of low correlated assets. In other words, you want to hold investments that (to the greatest extent possible) do not rise and fall together. All global business sectors, from healthcare to manufacturing, from commodities to financials, etc. New Zealand represents less than 0.05% of the world’s economy. 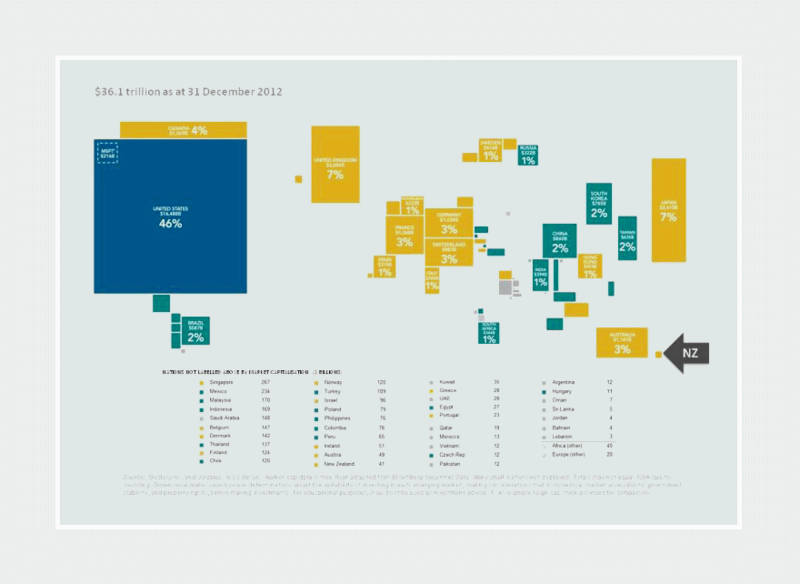 Visually speaking, if each country’s size on the chart below represented their contribution to the global economy, New Zealand would be represented by the dot next to the black arrow. Another academic study asserts that asset allocation alone accounts for 100% of a portfolio’s total return on average. Investment management using intelligent portfolio design enables Cambridge Partners to simultaneously reduce your risk and increase your expected return relative to holding any one individual investment. We hold assets in weights that offer our clients a greater expected risk/return trade-off than would be provided by investing in the New Zealand share market alone. Cambridge Partners has eight model investment management portfolios to address the variety of client risk and return needs. Do you have the income and wealth to ride our short-term market movements? Do you feel comfortable with the idea of losing portfolio value over the short-term in order to grow more wealth in the long-term? The first step in proper investment management and risk assessment is to determine the level of risk a client has the capacity to bear. What are your goals, dreams, and aspirations? How can your portfolio help you achieve those goals? What actions are necessary now to prepare for your future? How much income per year can you comfortably take out of your portfolio? This analysis is about you and how your investment management portfolio needs to work to serve your interests. It is during this process that our expert advisers will help you form a vision of what you can achieve, and just what it will take to get there. Regular reviews of your investment management portfolio not only lead to higher returns, but also ensure that your portfolio remains the best fit for you. Your circumstances, investment experience, risk and return objectives, and financial constraints change over time. Regular reviews ensure that this information is updated as it changes. This allows us to help you stay the course and make adjustments as necessary. Even the best investment management strategy will need to be adjusted to stay on track. To ensure your portfolio continues to offer you the highest probability of success, we will rebalance your investment management portfolio as required.